Helps prevent and temporarily protects chafed, chapped, cracked or windburn skin and lips. 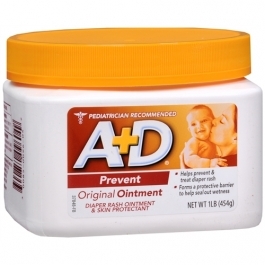 A+D ointment is a special all-purpose skin protectant that contains vitamins A & D. This soothing formula helps heal irritated skin and protects minor burns and cuts. It’s great for treating and preventing diaper rash. For skin protectant use: apply as needed. For diaper rash use: change wet and soiled diapers promptly. Cleanse the diaper area, and allow to dry. Apply ointment liberally as often as necessary, with each diaper change, especially at bedtime or anytime when exposure to wet diapers may be prolonged. Store between 68-77 degrees F (20-25 degrees C). Store upright when not in use.